A school that adopts a curriculum, that aims for a holistic understanding of technology, does so because it produces a better educated person than a curriculum which does not. How do we know when we are teaching technology holistically and why must we do so? Increasingly, more is asked of technology educators to be holistic in the understanding conveyed to learners of technology itself in order to make better informed technical and design decisions in a wider range of applied settings. The ability of the learner to naturally consider social and environmental factors, for example, when seeking solutions is seen by some State education systems in Australia as fundamental to a genuine education in technology ( New South Wales Board of Studies, 2000 & 2002 ). In philosophy, the holist position asserts that to understand the particular one must understand its relation to the whole and that only through reflection of one's sensation based applications can genuine knowledge be critically affirmed ( Matthews, 1980 , p.87 & p.93). The combined apparently independent paths of the State and the Holist positions set a compelling scene not only for the socio-economic necessity for holistic technology education in the curriculum but also for Technology's status as a key curriculum agent in the knowledge formation process of educated individuals. This paper asserts that the general elements of Applied Setting (including Time), Human (as Agent), Tool and Environment are well placed to be the necessary basics to any holistic human technological activity. How and why these elements work together, their schema, will be referred to in this paper as the 'Basic Principles'. The paper presents the thesis that Technology cannot be reduced to less than these general elements and as such, Technology is their product. We therefore may need to understand and teach these elements and their relations to each other explicitly, in ways that reveal the utility of such understanding when making technical choices and design decisions for all the genres of technology and at all their scales of application and discovery. The case is made for technology to not merely be a 'know how' learning experience, but necessarily also a holistic 'know why' learning experience essential for developing and transferring technological knowledge. The notions of holistic education are in themselves not new. Work on the importance of holistic education dates back in Western settings at least to Pestalozzi (1746-1827), Thoreau (1817-1862), Emerson (1803-1882), Alcott (1799-1888), Dewey (1859-1952), Steiner (1861-1925), and Montessori (1870- 1952); and more recently to Hill & Smith (1998) , Dufty, Dufty, Australian Curriculum Studies Association, & Holistic Education Network (1994) , and Fowlers (1998) . However, what is relatively new in Australia is that expressions such as "holistic solutions" are entering new draft Design and Technology secondary school syllabi ( New South Wales Board of Studies, 2002 ). There is a need to understand technology itself holistically in order to teach it with greater knowledge structure for learners. Redressing foundations for understanding technology itself is overdue in our rapidly changing societies and economies. While such general commentary has been recently entertained ( Lewis, 2000 ; Petrina, 1998 ), this paper seeks to examine the basis for a holistic understanding of technology specifically, and thus the curriculum, teaching, and learning implications that may flow from such understanding. It is timely to examine useful schemas for how educational curriculum and pedagogy may be structured to assure that learning in technology is indeed holistic in presentation, assessment, and reporting. What is needed is a robust universal schema. In addition to new school systems requiring students to learn technology holistically, there are emerging signs that such understanding is also becoming a vocational attribute expected of employees. Just as reporting is a motivator for what schools will focus on in the delivery of their courses, so too is it an emerging expectation for corporations and organizations to report on "The Triple Bottom Line": profit/loss, social and environmental balance sheets of effort, and expenditure ( Elkington, 1997 ; Wand, 2002 ). A desired capability is for employees to naturally be disposed to include social and environmental decision factors in their contribution to enterprise and production. In order for both students and employees to display holistic capabilities, this paper asserts that they ought first develop holistic understanding and holistic knowledge as a framework for guiding development of any associated capabilities in technology practice. There can be many approaches to understanding the phenomenon we label technology . Presented here is a phenomenological view to offer the reader a deeper grounding into why certain conclusions are drawn and schemas proposed. A schema gives teachers a framework to evaluate just how holistic a lesson or curriculum is and can help a teacher decide what educational tasks to include and how to construct the educational context and experience that will foster holistic understanding in technology and design. Many teachers would argue that they already teach technology holistically. However, the question we must pose is, how do we know? Question 1 : How do we know we are teaching technologies holistically? There are many responses teachers give to this question. Typically, they may range from "because my students discuss many issues in the design process" to "I make sure they engage in social and environmental perspectives." The problem with such responses is that what is holistic is not grounded in some universal reason or coherent schema of dependent relations. Why should discussing social and/or environmental issues be included for claims of holistic technological learning? Can one choose to discuss these elements, or must one connect the dependencies of these elements to the technology being learned? Such musings can quickly frustrate teachers, who often conclude that to teach holistically, one needs to teach and consider everything. At this point some teachers may be lost. Very often, at this point, some teachers find the task to revert to traditional "particulars" like tool skills and task technique is all they can do. That is, they revert to their narrow, but comfortable zones of assessing tools and technique skills and particular knowledge for a product so that the student can take home the object as a sign of successful learning. This paper suggests that such patterns of pedagogy should be redressed. Phenomenology of technology and knowledge development allows a teacher to use a basic principles approach to formulate a universal schema or cognitive framework. With basic principles, a teacher can indeed determine what to include in lessons and evaluations to ensure reasonable holistic coverage of any technical education. Surprisingly, we discover that technology education and practice are not only a how-to experience, but significantly a know-why experience. The latter is fundamental to the human act of creating new knowledge itself, not just using knowledge. Know-why capability is important for principles development. It fosters the reason why for things in many settings, accommodating both the benefit of situational learning while also enabling learning transfer or innovation to occur. Holistic education in technology enables transfer of understanding to novel lifelong encounters, a quality lacking in much of how-to training in technology particulars. The schema developed here begins with foundations in understanding how technical or material experience, as a phenomenon in human activity, develops a socially defined view of what knowledge is. When can we claim we know something? Dialectics and praxis are very useful reasoning tools for understanding the nature of an answer to this question in the context of technology education. Why is this important? This section of the paper presents the case that "knowing" and especially "understanding" occur better through holistic educational experiences in technology, if structured properly, compared to other modular, decontextualized, or disintegrated task skill approaches. It is significant in our construction to recognize that theory and practice dichotomies, as currently presented in many secondary and tertiary schools in technology, are a problem. "Theory is taught through practice, and good practice is grounded in good theory," as my education lecturer often drilled. We do not really want to present technology education as separating conceptual tool experience (how to think skills) from physical tool experience (how to do skills). We do not want to see "theory" classes estranged from "practical" classes, nor theory devalued or even employed as punishment in learning technology and design. It is not the product or the technical process we assess as educators, but the learner and his learning. Tool is defined here as anything we give use-value to as an instrument. A brick or our fist is a tool if we decide to use it as a club. A car is a tool if we decide to use it as a means to get us from A to B. An engineering algorithm is a tool if we decide to use it to determine a load on a beam. In each case, tools help us do things normally to manipulate a material , whether that material is at a scale we relate to in ordinary experience or extraordinary, like information/data that we manipulate with an algorithm or virtual tool . Question 2 : What exactly should be interconnected in our teaching of technology? The following formulates a case to answer this question. We will build the basic principles of what the minimums are for a holistic technological experience, ideally expressed in universal terms to permit knowledge transfer in teaching and learning for any genre of technology curriculum. The learner needs to become capable in technology and design matters and acquire lifelong principles. The road from dialectics to praxis is an interesting one for technology educationists because it addresses twists and turns (even head flips) from knowing as an essentially theoretical (idealistic) process to a social-material (surprisingly design- and technology-like) process. We will begin with Hegel (1770-1831), who was a German idealist philosopher born in Stuttgart. He was an idealist because for him, thought does not merely correspond to reality; it produces reality ( Speake, 1979 ): our thoughts are our reality and so all knowledge can be formulated through pure reason. "Dialectic" was Hegel's name for the pattern that logical thought must follow. Broadly, he argued that conscious thought proceeds by way of contradictions. Its process is by triads, where each triad consists of thesis, antithesis, and synthesis. The concept of "sharp" is not adequately understood without reference to an alternative "blunt." Both the thesis concept of sharp and the antithesis concept of blunt define each other and therefore require each other. To see each concept as related, as mutually defining, is their synthesis. At this moment a new level of reasoned understanding is achieved. Put another way, a person starts with a proposition, the thesis; this is consciousness as "understanding" and proves to be inadequate by itself. The person's mind must therefore generate its alternative, the antithesis. However, this on its own also proves inadequate. The resolution of the opposites, therefore, requires that they be combined into a synthesis. This is the level of conscious thought, or reasoned understanding . From here, the whole triadic process may be repeated, the synthesis leading to a new thesis, and so on. This is elaborated in Hegel's Phenomenology of Mind (1807) ( Vazquez, 1977 , p.371). Important to Hegel's philosophy of dialectics is that "knowing" for him begins, proceeds, and ends at the level of ideas. For him, matter is a product of mind, rather than mind being the highest product of matter. All our knowledge comes from pure theoretical reasoning. Feuerbach (1804-72) was a Bavarian philosopher and theologian. Although he was Hegel's student, much of his work was critical of Hegel's idealism. Generally, Feuerbach was a materialist in the sense that he distinguished between consciousness of an object and self- consciousness. At the same time, he connected the material object with the subject by pointing out that consciousness of the object always reveals some element of self-consciousness: "In the object which he contemplates, man becomes acquainted with himself, consciousness of the objective is the self-consciousness of man" ( Vazquez, 1977 , p.75). It is often said that Feuerbach inverts Hegel, turns him on his head. For Feuerbach, mind now becomes the highest product of matter rather than matter being a product of mind. All our knowledge comes from pure material experience. Marx on Hegel's Idealism and Feuerbach's Materialism: Resolving the Theory-practice Opposing Views of Knowledge. Marx (1818-83) was regarded by some as more of a social theorist, interested mainly in economics and history than in any particular philosophical doctrine. Essentially Marx, too, inverts Hegel's idealism. He extracted and supported Hegel's notion of dialectics, but rejected his idealist approach. He supported Feuerbach's inversion of Hegel, but differed from his concept of materialism in terms of the central notion of human practice, specifically the social dimension of practice. Marx rejected Feuerbach's relation between subject (the person) and object (the environment) in which the subject is passive and contemplative, restricting himself to receiving or reflecting reality. Here, knowledge was simply the result of the actions of objects in the external world and their effects upon the sense organs ( Vazquez, 1977 , p.118). Marx, therefore, identified the strengths and weaknesses of Hegel's idealism in dialectics and Feuerbach's passivity in materialism. Marx attempted to resolve the problems of idealism and materialism in his system of historical materialism, the central concept of which focuses on the practical interaction, which must occur between a person and his/her material and social environment . In parallel with Hegel's dialectics, the synthesis of people and their environment, via practical human socially contextualized activity, meant that a new level of awareness was achieved. Both the person and the environment were transformed ( Vasquez, 1977 , p.193). Technology is not the slave of science nor the neutral tools in designing. Rather, technology is one of their full and equally rich symbionts and plays an active role in knowledge formation! In Question 1 , the paper initiated the quest for the need to learn technology holistically. In Question 2 , the essential interconnected elements were exploredfor what may constitute the holistic foundations of technological understanding. To progress to the final stage in this paper, there is a need to establish both the structure and nature of such a holistic understanding of technology that permits its status as a study area that is both essential to knowledge development and to application. The integrating notion of praxis is proposed as a useful mental tool to address the final step of synthesizing how the elements of human (as agent), tools, and environment, applied over time, work together. Question 3 : How do the applied setting, human, environment, and tool elements combine holistically so that a person comes to know something of the world? Marx departed from Hegel and Feuerbach by the importance he places on actual human labor or practice. He adopted a dialectic methodology in that he contrasts and identifies the inadequacy of "pure" idealism and "pure" materialism; he synthesized the two at the new level of historical materialism. This introduces the importance of time. The applied setting is subject to evolutionary influences. Both theory and practice in the applied setting are resolved best, according to Marx, via human material practice in social and historical context. Marx's thesis of historical materialism is essentially the foundation of praxis. Praxis and technical activity concern the effect of instruments and tools in the human transformation experience. 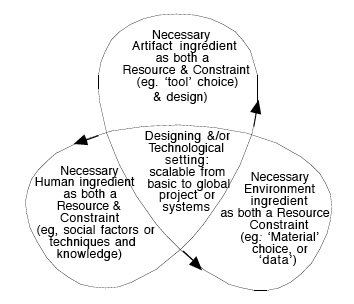 The contributions of Don lhde (1979) on instrumentation are summarized as key notions to a schema for constructing basic principles in holistic technology and design education. Ihde acknowledged that technologies need to be understood in context and in purpose of application. That is, different kinds of technologies and tools transform our knowledge differently. Also, the same tools and technologies placed in different "world" settings transform our knowledge differently, including the same tools/technologies in different social and/or material environment settings, that is, different world settings. This is significant because it raises the necessity for understanding that both choice and design of tools and choice and design of world settings alter our knowledge. Technologies are context sensitive- a key notion in technology choice, transfer, and innovation diffusion. Designs of tools and environments are socially and environmentally interdependent. To present technology teaching and learning as value- and context-neutral is to misinform the learner. The ability of the learner to naturally consider social and environmental factors when seeking solutions to design and technical challenges is fundamental to a genuine education in technology. Human, tool , and environment in an applied setting are the minimum elements of any technological activity. Each element is a resource and constraint, and each require the other to define their value in the applied setting. The elements are interdependent. Technology cannot be reduced to less than these general elements and as such, technology is their product. We therefore may need to understand and teach these elements and their dependent relationship explicitly. We now have a basis for determining the absolute minimums of what constitutes holistic technology education ( Seemann & Talbot, 1995 ). To teach any technical process, to evaluate technologies, or to make design decisions that ignore this interdependent schema of human, artifact/tool, and environment is indeed not an education in technology. In the theme of Dewey (1963) , the interconnectedness of knowledge constitutes a key feature of an education. Figure 1 . Minimum elements and their dependencies to teach in and about any applied design and/or technology setting. The basic principles of holistic technology education now appear to have structure, a structure articulated elsewhere as technacy education ( Seemann & Talbot, 1995 ). When teachers instinctively claim that they include social (human) factors, technical (tool) factors, and environmental (material) factors in their lessons for specific applied settings, they indeed have good reason to believe their pedagogy is heading toward being holistic. However, this coverage cannot be delivered in a general way. It is important to present the interconnections in explicit detail highlighting necessary and specific dependencies that make sense. A key requirement is to set learning experiences and assessment tasks for each lesson and unit of work that not only address highly specific links that define the elements in relation to each other, but also their total effect as a design and technology solution in the applied setting. In a very real sense, technology is the product of the schema interacting to satisfy a need or an aspiration. Dewey, J. (1963) . Experience and education . NY: Collier. Dewey, J. (1966) . Democracy and education . NY: The Free Press. Dufty, D., Dufty, H., Australian Curriculum Studies Association, & Holistic Education Network. (1994) . Holistic education : Some australian explorations . Belconnen, A.C.T. : Australian Curriculum Studies Association. Fowlers, J. (1998) . Problem solving in technology education: A Taoist perspective. Journal of Technology Education , 10(1). Hegel, G. W. F., & Miller, A. V. (1989) . Hegel's science of logic . Atlantic Highlands, NJ: Humanities Press International. Hill, A., & Smith, H. (1998) . Practice meets theory in technology education: A case of authentic learning in the high school setting. Journal of Technology Education , 9(2). Ihde, D. (1979) . Technics and praxis . Dordrecht, Holland: D. Reidel Pub. Co.
Lewis, T. (2000) . Response to Steve Petrina's book review and John Ritz's comment. Journal of Industrial Teacher Education , 37 (2). Matthews, M. R. (1980) . The Marxist theory of schooling: A study of epistemology and education . New Jersey: Humanities Press Inc.
Peters, R. S. (1971) . Ethics and education . USA: Scott, Foresman and Co.
Petrina, S. (1998) . Men at work: Inspecting the foundations of technology education. Journal of Industrial Teacher Education , 36 (1), 99-121. Seemann, K. W., & Talbot, R. (1995) . Technacy: Towards a holistic understanding of technology teaching and learning among Aboriginal Australians. Prospects , 25(4). Speake, J. (1979) . A dictionary of philosophy . London: The MacMillan Press. Suchting, W. A. (1983) . Marx, an introduction . Brighton: Wheatsheaf Books. Vazquez, A. (1977) . The philosophy of praxis . London: Merlin Press. Wand, P. (2002, August.) . Wealth creation . Paper presented at the Desert Knowledge Symposium and Expo. Alice Springs: Desert Knowledge Australia Inc.
Kurt Seemann ( kseemann@scu.edu.au ) is a faculty member at Southern Cross University, Coffs Harbour, Australia.